The cruise control system allows you to drive at speeds above 25 mph (40 km/h) without depressing the accelerator pedal. If the cruise control is left on, (CRUISE indicator light in the instrument cluster illuminated) the cruise control can be activated unintentionally. Keep the cruise control system off (CRUISE indicator light OFF) when the cruise control is not in use, to avoid inadvertently setting a speed. Use the cruise control system only when traveling on open highways in good weather. Do not use the cruise control when it may not be safe to keep the vehicle at a constant speed: Driving in heavy or varying speed traffic. On slippery (rainy, icy or snow covered) roads. Hilly or winding roads. Very windy areas. 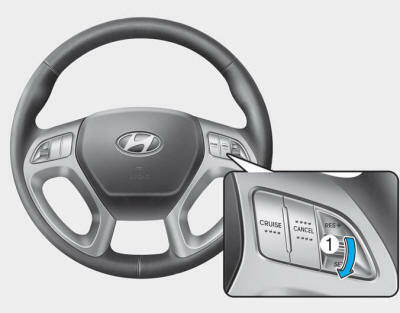 1.Push the cruise ON/OFF button on the steering wheel to turn the system on. The CRUISE indicator will illuminate. 2.Accelerate to the desired speed, which must be more than 25 mph (40 km/h). 3.Push the lever (1) down (to SET-) , and release it. The SET indicator light will illuminate. The vehicle may slow down or speed up slightly while going uphill or downhill. Push the lever (1) up (to RES+) and hold it, while monitoring the SET speed on the instrument cluster. Release the lever when the desired speed is shown and the vehicle will accelerate to that speed. Push the lever (1) up (to RES+) and release it immediately. The cruising speed will increase 1.0 mph (1.6 km/h) each time the lever is operated in this manner. Depress the accelerator pedal. When the vehicle attains the desired speed, push the lever (1) down (to SET-). Push the lever (1) down (to SET-) and hold it. Your vehicle will gradually slow down. Release the lever at the speed you want to maintain. Push the lever (1) down (to SET-) and release it immediately. The cruising speed will decrease 1.0 mph (1.6 km/h) each time the lever is operated in this manner. Lightly tap the brake pedal. When the vehicle attains the desired speed, push the lever (1) down (to SET-). Depress the accelerator pedal.When you take your foot off the accelerator, the vehicle will return to the previously set speed. If you push the lever (1) down (to SET-) at the increased speed, the cruise control will maintain the increased speed. Pressing the CANCEL switch located on the steering wheel. Pushing the cruise ON/OFF button. Both the CRUISE indicator and the SET indicator will turn OFF. Moving the shift lever into N (Neutral). Decreasing the vehicle speed lower than the memory speed by 9 mph (15 km/h). Decreasing the vehicle speed to less than approximately 25 mph (40 km/h). Downshifting to the 2nd gear with sports mode. Each of the above actions will cancel cruise control operation (the SET indicator light in the instrument cluster will go off), but only pressing the cruise ON/OFF button will turn the system off. If you wish to resume cruise control operation, push the lever up (to RES+) located on your steering wheel. You will return to your previously preset speed, unless the system was turned off using the cruise ON/OFF button. Push the lever (1) up (to RES+). If the vehicle speed is over 25 mph (40 km/h), the vehicle will resume the preset speed. Push the cruise ON/OFF button (the CRUISE indicator light will go off).